How did you choose Tesla as a subject? One day I stumbled across this outrageous conspiracy theory article about Nikola Tesla, how he had secret journals that disappeared after he died, that the FBI took them, and that they contained plans for death rays and god-knows-what else. Maybe an hour later, I was still digging down this Internet rabbit hole, finding little scraps of hints and clues, this wonderful bottomless pit of Tesla intrigue, and I said to myself: what if he had something REALLY crazy in those journals? Like an Interdimensional Transfer Apparatus? Side note: I also loved Tesla in The Prestige, especially David Bowie playing him. That rocked. You thank a Tesla family member, William Terbo. Did you get useful input from him? Tesla died penniless, in debt actually, with no family. EXCEPT William Terbo. It turns out Tesla’s last living relative, his grand nephew, is this 85-year-old regular guy living in New Jersey. As I wrote the parts of the book, I’d snail mail them to William (no email, please! ), and we’d talk about whether Tesla would say this or that, what his views were on things like alcohol or taking risks or whatever. William’s a great guy. And sharp as a tack at 85. Was the style of writing [as if by email] there from the start as you came up with this story? When the first scene with Chip came to me, sort of amorphous, I actually sat down and typed it as an email to my brother Ken. So the voice was very casual, and the email form lent it a sort of immediacy, like “hey, are you there?” I didn’t pick it up again for months, but when I reread it, I liked the urgency of the email, and how intimate it felt — just one person communicating with one other person. So I ran with it. Did the story change much from your first concept of it to the finished version? 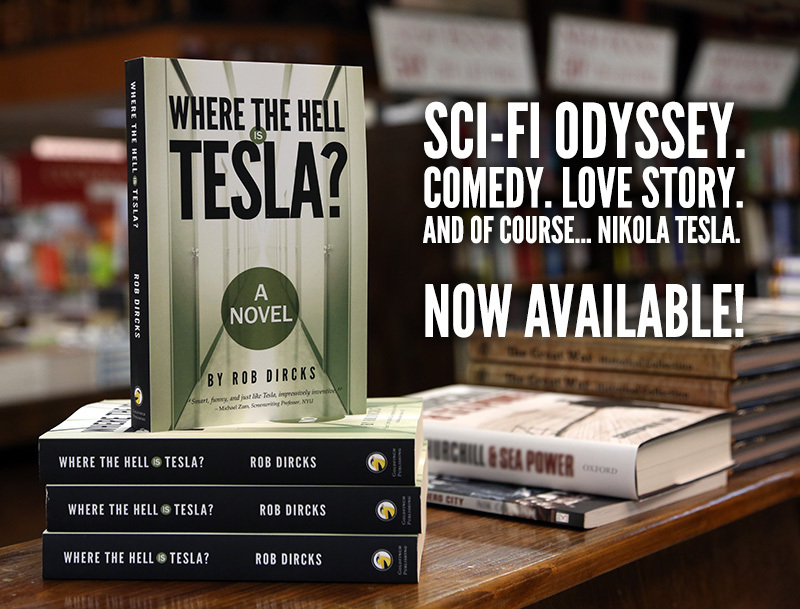 In the beginning I thought the story might be more about Tesla, but it’s really so much the story of Chip, and his burning desire to get home to his girl, and how he grows up a little through the book. So I was okay making everyone else sort of orbit around Chip. Were there many other possible dimensions you considered exploring but left out? Sure. Lots of ideas about other beings that would have evolved differently than humans under different circumstances. A race of huge cockroaches (they survived an apocalypse). Dinosaurs. A really dark dimension, where they’d have to figure out how to see ultraviolet light. The inside of a planet-sized creature who swallowed Earth at some point in the past. And lots of head-scratchers  like what if they found a dimension with another Tesla in it? Or a BUNCH of Teslas? Yikes. The biggest one I left out was Bobo’s dimension. The whole time I was writing, I was thinking “where the hell did Bobo come from anyway?” I thought about it a lot, but that would have been a rabbit hole, too. The book would have been twice as long. What would you compare this novel to in style? For books, maybe Terry Pratchett and Neil Gaiman’s Good Omens. Not that I deserve the comparison to maybe the best science fiction comedy novel ever. But I loved the casual dialogue style of the two main characters – they’re at odds constantly, but underneath they’re best friends. Their dialogue is priceless. I can only hope to ever write that well. As far as the serial-letter format style, I don’t think I’ve read enough to do a fair comparison. I’m sure there are plenty of books in the serial-letter form. But from my limited personal experience? I just read The Martian by Andy Weir, and it’s written in a diary form that’s similar, his diary of being trapped on Mars alone and trying to figure out a way home. Great use of the form. Also for some reason Cormac McCarthy’s The Road pops into my head. He didn’t pay much attention to traditional form, indents, Strunk & White stuff in that book. He just wrote the story in a really intimate way. I sincerely hope to someday write the best science fiction novel of 2015 that I can. Maybe this one’s it. I don’t know.